Mike’s 32nd Annual Celebration of Being Born! Home / Home / Mike’s 32nd Annual Celebration of Being Born! What to do when you need a new Birthday Party idea??? Well how about a Scavenger Hunt around your city? That's what Mike's friends did! Mike was surprised by his friends with a new take on Saturday Morning Cartoons... 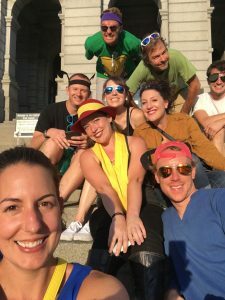 Dressed as various cartoon characters, with Mike as a TMNT, they took to the streets of Denver to unlock clues and challenges that led them through the city. Their adventures required them to discover the secrets of Denver while having a blast completing the Denver Scavenger Hunt Party!